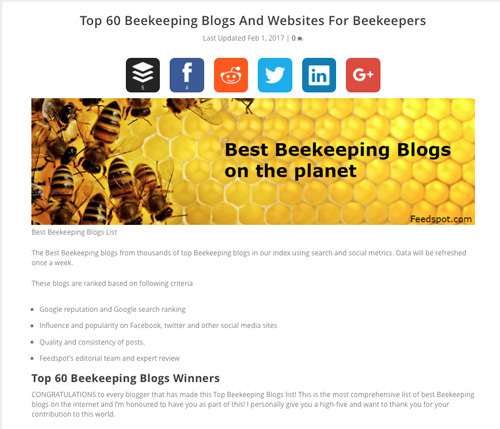 We just heard that our beekeeping blog has been awarded the top 60 beekeeping blogs on the planet! Thank you Anuj and all those who voted. We have been providing free beekeeping advise and tips for over two decades and we our proud that many of our readers have gone on to become professional beekeepers. Our blog hopes to create interest and understanding of the art of beekeeping, making it easier to understand and to take up. As 4th generation hands on beekeepers we are happy to share our knowledge and learn from others as well. Beekeepers since 1924 we still have a lot to learn ourselves. I would like to personally congratulate you as your Beekeeper’s Blog has been selected by our panelist as one of the Top 60 Beekeeping Blogs on the web. I personally give you a high-five and want to thank you for your contribution to this world. This is the most comprehensive list of Top 60 Beekeeping Blogs on the internet and I’m honoured to have you as part of this!